Opening: If I picked chamomile flowers / as a child / in the windy fields and whispered / to their fuzzy faces, / imagine. Have you ever imagined who you might be when you grow up? When Juan Felipe Herrera was very young, he picked flowers, helped his mama feed the chickens, slept under the starry sky, and learned to say good-bye to his amiguitos each time his migrant family moved on. When he grew up, Juan Felipe Herrera became a poet. Doesn’t that cover just tug at your heart? This beautiful book is taken from Juan Felipe Herrera’s poem, “Imagine.” It depicts Herrera’s life as the young boy of migrant workers spending time outside exploring nature, traveling across country with his parents in search of work, learning to read, write and speak a new language when he attends school. He is a curious dreamer who loves life, nature and words. As a teen his words become stories, poetry and lyrics to songs. As an adult, he becomes the U.S. Poet Laureate from 2015 to 2017. Written in free verse, each page begins with “If I picked…if I walked.. if I practiced…If I wrote ” and ends with “imagine.” His poetry beckons children to be dreamers of their futures — to “imagine” their own stories as they read his beautiful lyrics. What stories will they write for themselves? Will they be poets, scientists, artists, lawyers, doctors and musicians? They only need to imagine what they can do. Lauren Castillo’s ink and foam monoprint illustrations are warm and cozy and beautifully compliment Herrera’s poem. Her earth-toned illustrations are in soft shades of tan and brown, with yellows, blues and greens highlighting each page. Make sure you check beneath the book jacket to discover a dreamy blue cover speckled with stars. Resources: This book can be used in many different ways by educators. Different pages will inspire students. 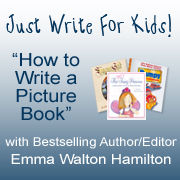 Encourage kids to pick a page and imagine who might they be when they grow up. The “If I…” prompts are a great opener for writing a few paragraphs about their stories. Other students may want to draw a picture about themselves and their story. Synopsis: Relaxations is a guide on mindfulness techniques for children ages 4 to 8. Creative metaphors work to help children achieve a state of calm and concentration through breathing, relaxation, and visualization. This book uses gentle affirmations to improve and enhance confidence, self-esteem, concentration, and creativity! Synopsis: Bentley the bee lives in a busy, bustling hive. One day, when the other bees rush out to make honey, Bentley decides to meditate first. The other animals are curious about what Bentley is doing — so he teaches them how he uses meditation to focus, feel calm, and soothe difficult feelings. Just like adults, children can benefit from turning off electronic devices and being present to what is happening to them in the moment. Bee Still is a child-friendly introduction to meditation. Children and parents will fall in love with both charming books. The world can be a noisy place for young minds. These books are great resources that help children cultivate a little more peace in their lives and learn to just “be.” Each book offers practical approaches to applying the skills of mindfulness and compassion to live with more wonder, love and joy. The books are nicely paired because of their unique perspectives. Learning to relax and meditate is a quiet activity that children and parents can do together — even if it is only for five minutes a day. All family members can benefit in this age of social media and electronic devices. It is quality time spent together. The illustrations in each book are stunning. The artwork in Relaxations is simple and bold. In Bee Still, the artwork is whimsically detailed and stunning. Resources: Both books contain a guide for simple meditation and exercises for young readers at the end in a Note to Parents. *Review copies of both books were provided by the publisher. This week is the 15th anniversary of Peter H. Reynold’s international bestselling book, The Dot, about a girl named Vashti, who doesn’t think she can draw. Her teacher believed in Vashti and asked her to make a dot. She stabbed her dot on a piece of paper and handed it to her teacher. Her teacher asked her to sign it. A few days later, Vashti saw her “dot” framed and hanging at the front of the class. Fifteen years later, Vashti’s act of courage continues to inspire children worldwide. It is also the 10th annual celebration of International Dot Day, started by teacher T. J. Shay. Nearly 13 million students from 177 countries will be participating. Each year is bigger and better. It will be a fun week for children worldwide to read The Dot in 12 different languages and braille, sing the Dot Song, use their imaginations to make their unique and creative dots, and share their masterpieces. Many classrooms have signed up to SKYPE and connect with each other in the U.S. and around the world. Make sure you visit Dot Central. Authors have created Celebri-Dots. 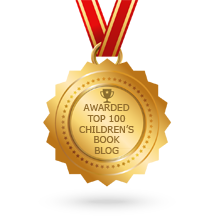 KidLit bloggers are making their marks today and all week. Please remember to post your dots on your websites, Facebook and Twitter using @DotClubConnect, #dotday and #makeyourmark. 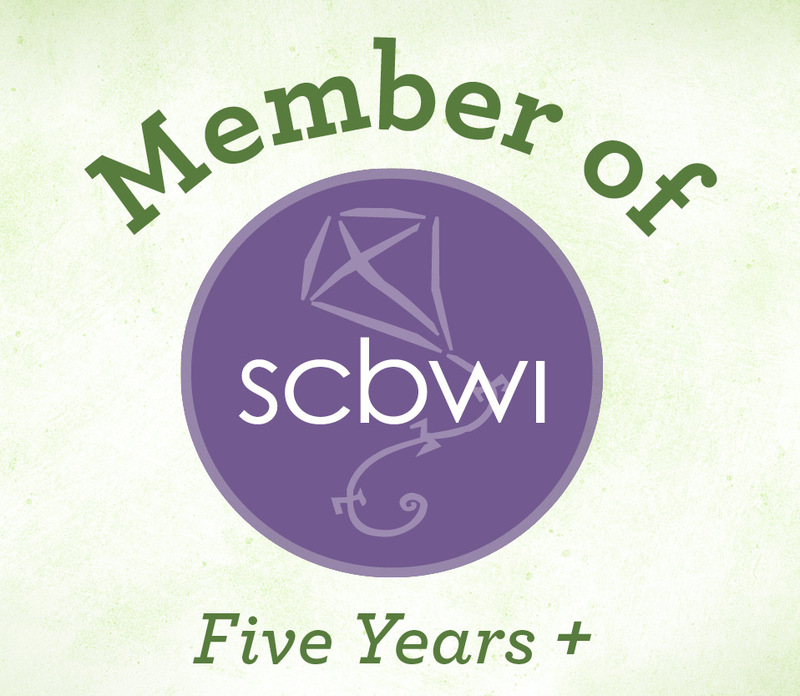 Check out Beth Stilborn’s website to read her Dot Day post and view her creative dot. 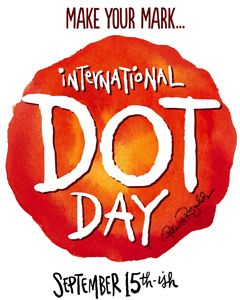 Happy International Dot Day from Children’s Books Heal! Opening: One day, Line met Dot…and they decided to play together! The story begins with a white Line and a black Dot. They begin to make bold and brand new things. It is so much fun that Line and Dot decide to invite their friends — big and small, young and old — the more the merrier. They bring with them more ideas. With so many new friends they realize that together they sky is the limit and they are empowered to create so much more. Soon they have built a large city. But something is missing. Line and Dot have another big idea. They invite their friends who live in distant lands. They arrive from all of the corners of the world to their city. The lines and dots are a festival of color — blue, yellow and pink, black and white — and they create something very wonderful. Line and Dot is a joyful and engaging book for young children and one that belongs in classrooms. It encourages creativity and imagination. It cleverly shows the importance of accepting differences, learning something new from others, and living peacefully while maintaining individuality, differences and diversity. With simple text and whimsical illustrations, this story demonstrates the importance of mutual respect and cooperation. Resources: This is a great classroom resource with endless possibilities for use. Teachers can simply focus on creativity and imagination by encouraging children to draw a picture using line and dots. Put kids on teams and encourage them to work together to come up with an idea and paint or draw it with lines and dots. There are no right or wrong answers, just the fun of creating something together. Véronique Cauchy was born in Normandy in 1969. She had a penchant for writing at a very early age…but instead she studied business, going from Paris to Berlin via Reims and Sacramento! An expert in international trade, she directed a human resources company in her native Normandy, but her life changed when she had children. She discovered children’s literature and threw herself into the crazy adventure of writing for young readers. Do you know how to breathe? Do you really know how to breathe? When a young boy can’t sleep, his mother teaches him how to breathe with his whole body. He learns new ways to move his body, notice his breath, and calm himself. He can pretend he is a ringing bell, a cat, a rocket…any number of things! The activities combine controlled breathing, stretches, and visualization, and are an introduction to mindfulness and meditation that can be used to help induce sleep or just to calm the body and mind. The story is a conversation between a boy and his mother when he can’t relax and go to sleep. The mother is a shadow in the background on the first page as she teaches her son how to breath properly. If you teach children how to breathe and relax at a young age, they will have tools to use throughout their lives. Focusing on breathing helps them to stop thinking and quiet their minds. 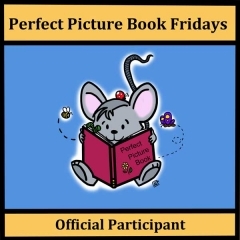 The book helps children learn to visualize and use their imaginations. The exercises the mother uses to guide the boy — floating on a wave, smelling roses, blowing up balloons, launching a rocket and breathing with vowel sounds — are shared at the end of the book with detailed information on how to do each exercise and how they help children work through fear and anxiety. This is a wonderful family activity. Author Inês Castel-Branco’s illustrations are joyful, peaceful and simply beautiful. Readers will feel the positive energy flowing from the boy just by studying each illustration and the exercise he is attempting. Make sure you check out the end papers as they are filled with poses taught in the book. Resources: Breathe is a picture book that helps children work through worries and fears by playful breathing, stretching and relaxation techniques. There is a Note to Parents and Caregivers at the end that includes exercise techniques based on yoga, tai chi, chi kung and meditation. Inês Castel-Branco founded Fragmenta Editorial in Barcelona with Ignasi Moreta, and so submerged herself in the fascinating world of the typography and layout of books. With the birth of their three children, Inês returned to making models (now of castles, zoos, and doll houses) and they discovered the marvels that can be made with recycled objects, which are explained on Ines’s Spanish blog, “Mama Recicla.” Their love of children’s books also grew, until they decided to start this collection. One morning during breakfast, she “saw” in her mind the book that you now have in your hands, and she once again took up her brushes and painted. *A copy of this book was provided by the publisher. Book Synopsis: It all started with two garbage bags full of Legos. Or not, maybe it started with the two thugs following 12-year-old Lolly down 125th that night. Or maybe it was Jermaine’s dying. Or that fight they had before ‘Maine got shot. Yeah, probably it was that. Lolly’s having a hard time knowing how to be without his older brother around. Seems like he’s either sad or mad. The thing that helps most is building. His mom’s girlfriend, Yvonne, gave him two huge bags of Legos for Christmas, and Lolly’s working on an epic city — a project so big it outgrows his apartment. The community center lets him work on his magical Lego city in a storage room which provides Lolly with an escape—and an unexpected bridge back to the world from his grief. But there are dangers outside that persist. There are older guys who harass, beat up and rob Lolly and his friend Vega on the street. They pressure the boys to join a crew (gang), like his brother Jermaine. What would Jermaine want him to do? Get with a crew and take revenge? Or build a different kind of world for himself. Lolly’s going to have to figure this one out on his own. David Barclay Moore has penned a powerful debut novel with a gripping plot and timely, real-life issues for young people of color. He opens readers eyes to how 12-year-old boys are easily targeted and drawn into gangs/crews as a way to survive. They don’t want to be part of gangs, but they are beaten, robbed, threatened and bullied into submission. It’s a way of life in many inner city neighborhoods where opportunities are limited. They believe that having the protection of a gang can save their lives, but it can also kill them, like Lolly’s brother, Jermaine. I like how the author helps Lolly deal with his brother’s loss through imagination, creativity, and his love of architecture. Lolly builds epic cities with fantastic stories. He doesn’t realize that he is a gifted artist and storyteller headed for great things. The relationship between two very unlikely friends, Lolly, who doesn’t know what to do with his anger and grief, and Big Rose, who is on the autism spectrum, is my favorite part of the story. Lolly is furious about the center’s director giving Rose permission to build Lego cities in the storage room with Lolly. But, then he begins to see her talent and speed at building. They end up traipsing all over New York City studying, photographing and drawing its unique architecture. They need each other and are important to each other’s growth healing. A major reason the author wanted to write this novel is because he feels “there aren’t enough books that speak with the voices of the characters in his story.” For instance a slang word in one Harlem neighborhood may not even be used in another neighborhood a few blocks away. So the narrative is richly textured and thought-provoking, and offers hope and an opportunity for self-discovery. 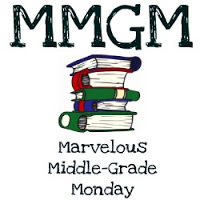 This novel belongs in the hands of every teenager and middle grade and high school. It offers students the opportunity to engage in important discussions about real life and modern social issues. David Barclay Moore was born and raised in Missouri. After studying creative writing at Iowa State University, film at Howard University in Washington, D.C., and language studies at l’Université de Montpellier in France, David moved to New York City, where he has served as communications coordinator for Geoffrey Canada’s Harlem Children’s Zone and communications manager for Quality Services for the Autism Community. He has received grants from the Ford Foundation, the Jerome Foundation, Yaddo, and the Wellspring Foundation. He was also a semi-finalist for the Sundance Screenwriters Lab. David now lives, works, and explores in Brooklyn, N.Y. You can follow him at his website. Opening: Every kid in Lola’s school was from somewhere else. Hers was a school of faraway places. Junot Díaz has written a poetic and nostalgic story about Lola’s family immigrating from their home on the Island (likely the Dominican Republic) to build a new life in New York City. Lola’s lively and exuberant curiosity leads her on an enchanting journey of discovery of self-discovery. She relies upon the memories of her family, friends and neighbors to help her imagine an Island and a culture that has bats the size of blankets, music, dancing, bright colors, sweet mangoes, beautiful beaches, tropical sunsets, hurricanes and a terrifying monster (dictator) who hurts the people. Leo Espinosa’s dazzling illustrations bring Lola’s Island to life. They are a beautiful celebration of creativity and diversity. 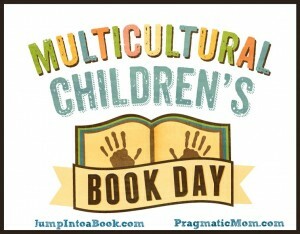 Brown children will see themselves in the many different skin-tones. Beautiful collaborative effort between the author and illustrator. This book belongs in school libraries. Junot Díaz was born in the Dominican Republic and immigrated to New Jersey. He is the author of the critically acclaimed Drown; The Brief Wondrous Life of Oscar Wao, which won the 2008 Pulitzer Prize and the National Book Critics Circle Award; and This is How you Lose Her, a New York Times bestseller and National Book Award Finalist. Visit him at his website. Opening: Welcome to our planet Earth. The magical White Feather Flier is back on a new adventure to heal the Earth! Use your imagination power to make it fly and take you on a great helping journey. The Flier’s mission is to transport readers around the world, to engage them in helping to save the environment, and to teach one and all to love our planet. Just press a button printed on the page, and point the plane up in the air to fly, or down to land it! Bring medicine to people in need! Dive below the ocean to bleached coral reefs! Visit the city to cultivate green spaces! Help the rain forest return and give its animals a home! An inspiring, lyrical story, rooted in Lennon’s life and work, Heal the Earth is filled with beautiful illustrations that bring the faraway world closer to young children. It beautiful interactive book that speaks directly to younger children and empowers them to be part of the magic of healing and loving our planet and its inhabitants. The spare text is lyrical and skillfully written with vivid imagery. Smiljana Coh’s gorgeous illustrations will appeal to children’s senses. She includes a diverse cast of characters and children will see someone who looks like them. Readers are asked questions and invited to join the adventure. They will be encouraged to use their imaginations and push buttons at the bottom of the pages to transport them to areas of the earth that are in need of healing. They see the problems that exist and then are given the opportunity to make a positive impact. Every time they succeed, they are congratulated for a job well done. There is age-appropriate geographical information about the planet and how it is divided into continents. Kids are encouraged to touch each continent, say its name and pick the continent where they live. The book includes words to a new, special poem written by Julian Lennon, specifically for Heal the Earth. It is a lovely addition to the book and could be a stand-alone-book. A portion of the proceeds from book sales will go to support the environmental and humanitarian efforts of the White Feather Foundation, the global environmental and humanitarian organization that Lennon founded to promote education, health, conservation, and the protection of indigenous culture. Resources: The book is a great way to approach the subject of caring for the earth, during Earth Day. It is a resource because it encourages children to discuss problems around the globe and ask a lot of questions about getting involved in preserving their planet. Julian Lennon is a Grammy-nominated singer-songwriter, photographer, documentarian, philanthropist, and author of the New York Times bestselling children’s book Touch the Earth. Born in Liverpool, England, Lennon is an observer of life in all its forms developing his personal expression through his artistic endeavors. He hopes that his kids book trilogy will inspire and educate children to preserve our planet for future generations. Opening: Although William lived in the magical land of fairy tales, he preferred pastries to princesses, kitchens to kingdoms, and recipes to the Royal Reporter. Book Jacket Synopsis: In the magical land of fairy tales, William doesn’t quite fit in. He’d rather poach pears than pursue princesses, and he values gnocchi over knighthood. . . .
Today I’m giving a little more book love to A Cooked-Up Fairy Tale. It is a charming and clever take on some beloved fairy tales. William wants to be a chef and changes the fairy tales by using some apples, beans and a pumpkin to create delicious creations for Fairy Tale Headquarters. Instead he cooks up trouble. Now fairy tales must have a happy ending, so William must succeed without compromising his dreams to be a chef. Klostermann’s magical story-telling is original, entertaining and full of mouth-watering food wordplay that will satisfy readers. There is a gentle flow to the text. Ben Mantle’s colorful illustrations are comical, expressive and will tickle kid’s imaginations. Penny Parker Klostermann is the author of There Was an Old Dragon Who Swallowed a Knight, also illustrated by Ben Mantle. A love of eating led Klostermann to notice food items in fairy tales. She digested this information and came up with the idea for this story. Visit Klostermann on her website. Resources: I have reviewed many new books recently that feature cooking themes. It is a great way to encourage kids to help bake gingerbread cookies, an apple dumpling or pumpkin pie.